As often happens in life, challenges seem to come in threes or more. What my challenges have been are personal in nature and have to do with others I care about too, so the details are not for public consumption. Suffice it to say, I was having a bad day yesterday and my dear friend Margaret suggested that we needed a trip to the springs. This trip opened a whole new world to me, a world I may never be able to leave. To Margaret, I will be eternally grateful. She is such a gifted artist. Before I share any of my other photos, you must visit her website at: http://www.margaretrosstolbert.com/. Margaret will find a way to get near whatever it is that calls to her cramped quarters or not. She is an adventurer and fully immerses herself in the world of the springs. For me, I started a bit on the outskirts. 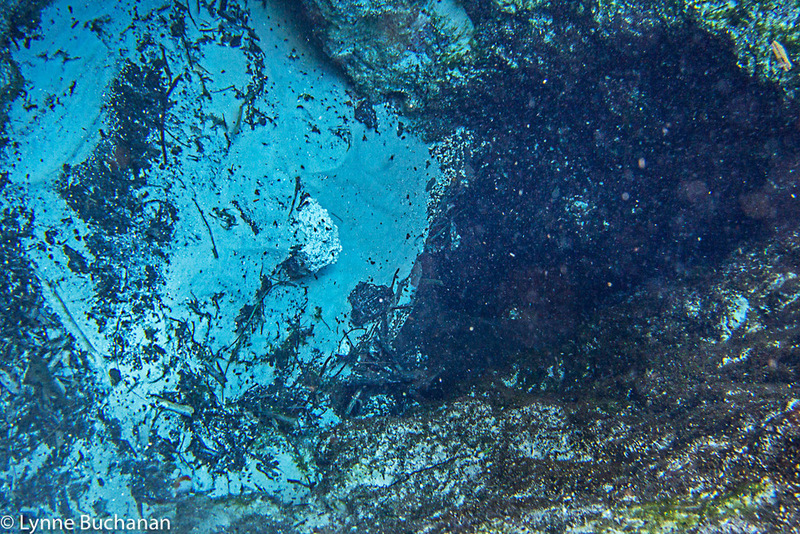 I've been to the springs before, but never with a mask and I usually photographed above the waterline and not below. A whole universe is down there waiting for exploration. Before I followed Margaret into the depths, I still had to explore what was yearning for the light. Margaret, on the other hand, was one her way down. I realized I was out of my league. I wasn't even sure if I had a dry snorkel or not. So much to learn. On the other hand, it was very cool to be in the in between space watching what was going on–learning how to go deeper the next time. I felt kind of like my first child who walked later than the rest of his friends. He was studying what the others were doing and why they fell down, so when he went for it he wouldn't be afraid and could embrace the experience full on. In the middle realm, there was a lot to experience. I was fascinated how both light and dark exist beneath the surface and the harmony they seem to coexist in. Then I saw a fish emerging. I felt that it was a symbol of the fluidity from which it is possible to go from one universe to another, from above ground to below, from light to dark and vice versa. Margaret, on the other hand, was pretty much all the way in by then. She clearly does not suffer from claustrophobia. It may take me a few more trips before I can do this. Maybe more than a few. My mind is definitely not closed to the possibility though, and I am sure the perspective she gains is worth it. I love handstands and going upside down. Just never tried it in the water before quite like this, but I am sure the perspective she achieves partly contributes to what makes her art so great. All preconceived notions are erased. She is there with the walls and the filtered light, and the mystery. What is possible to see where I was daring enough to venture in these springs closer to the surface is equally rewarding though. After being in so many troubled waterways in Florida, I was in heaven to see healthy sea grasses dancing in the flow of water, thriving without having to battle toxins that were strangling the life force out of them. This is the way it is supposed to be when clean water flows free. There are not many places like this anymore, and when you are blessed to be near one everything that ails you starts to lift. We knew it was still healthy there because the floor of the springs were covered with snails and snail tracks. It was truly incredible how many there were. In fact, I have never seen so many snails. It made my heart happy. Which is probably why I saw a heart in the formation below. It was not just beautiful below the surface though. When we entered Naked Run, I stopped for a moment before a fallen tree and stood up and took my mask off and I saw the riparian landscape around me bathed in a golden glow. The trees were mysterious with gnarly roots and I thought so above, so below. Below are so more photographs of this underworld fantasy. Everywhere I looked seemed to be another invitation to a mystery, a mystery that might have the answers as to how to achieve balance and bring our world back into harmony. Beneath the surface, dark and light seem to co-exist in harmony. Life flourishes right next to darkness. Integration seems possible. Diversity is not a threat. Balance is everywhere. This was an ecosystem not disturbed by man–at least not by too many human visitors yet on this day. A lot of trees have been swept into our rivers as the banks erode and then with the force of the water they get broken down further. I did not expect to see a mulch-like substance covering parts of the bottom, but natural forces sometimes defy expectations. We don't always know how Mother Nature operates, and I am sure the structure created by the decomposing trees provided habitat for fish and other creatures. When I saw this vegetation growing right up to the crack in the limestone where water was emerging, it reminded me of trees growing in cracks of sidewalks or near the edge of cliffs. When life wants to perpetuate itself, it finds a way. There were so many lessons under the surface of the springs. Diving deeper is often the answer, and even if problems are not solved it does away with preconceived notions and makes discovering new answers and ways of seeing possible. In one trip with Margaret, I may have become a springs addict. It is always best to go with a good guide–one that recognizes what lessons can be learned and their value. Margaret did not have to say a word. She pointed her camera, dove, noticed where I was looking too. It was awareness pure and simple, and I knew just how she felt. When we simultaneously pointed our cameras at each other, I suddenly had the thought the Virginia Woolf wasn't exactly right. You don't just need a room of your own, a female artist needs a woman friend who is on the same frequency regarding art and life. Now I know I am blessed. I don't think I could have dreamed up a more creative, open, fluid, art and adventure buddy if I tried.